Dr. Venugopal K. Menon is a native of Colonial British India and is the eldest of seven children. He wrote “My Mother Called Me Unni” to honor his mother who, at the age of 62 came to the United States, and to provide a legacy for his children and grandchildren. The author writes with passion and love as he describes his family and life in India prior to migrating to the United States. His book provides a wealth of information about life in India and how he viewed the impact his family had on him. However, there was so much information (historical), that it was hard to read at some points. The historical facts were sometimes overwhelming and the book had to be put down in order to process it all. There were several terms the author used that this reviewer didn’t understand and had to look up. The author uses many historical documents, pictures, and poems throughout the book that will have readers reflecting on their own family, the meaning of life, and what we want our loved ones to remember. Dr. Menon reflects the good and bad times in his life and is very inspiring in his writing. He is a well-respected member of the community and the medical field. When his mother migrated to the US at the age of 62, she adjusted well and became very active in her community and in the lives of others. 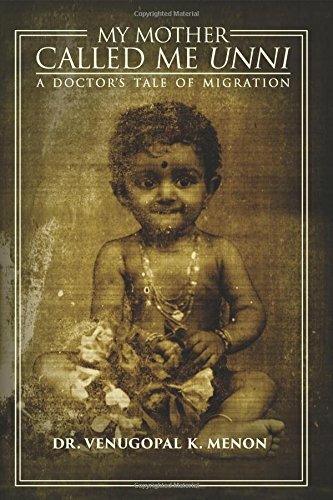 This reviewer found “My Mother Called Me Unni” by Dr. Venugopal K. Menon to be well written, and full of humor, compassion, and love. It is hard to even begin to write about this book, one really has to read it slowly, and do some thinking and reflection on one’s feelings about who they are, how they love, and how they see life.